"The fast paced development of broadband internet infrastructure makes high quality real time networked music performances possible. In recent years, the implementation of over-provisioned network backbones has led to the development of several initiatives that allow real-time or time-shifted interactions of geographically displaced musicians." - Renaud, Carôt, Rebelo. The following are examples of those initiatives carried out in my graduate research at the University of Calgary. 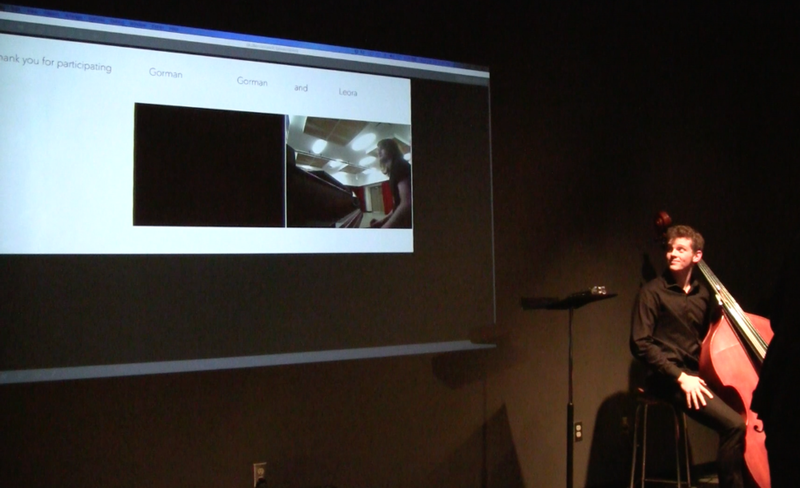 Each of the pieces utilized the digital presence workstation Artsmesh as the means for connecting audio between locations along with a custom software tool built in Max/MSP for calibrating network latency. More information on any of these pieces, the method for composing them, and the software used can be found in the document below. In instrumentation (human hands) and form (rhythmic phaseshifting), Topologies pays homage to Steve Reich’s Clapping Music, but the process does not function in exactly the same way. The piece was made out of a desire to plainly demonstrate how complex rhythmic interactions naturally reveal themselves in a piece of toporhythmic network music. Network Gyre was my first attempt at composing a toporhythmic network music performance. It was performed once between the University of Calgary and the Central Conservatory of Music in Beijing and once between the University of Calgary and Montana State University. The recording is from a performance between two locations on the University of Calgary campus. The term gyre refers to any spiral or vortex, in this piece it specifically refers to a system of ocean currents called the North Pacific Gyre. Each section of the piece corresponds to one of the four currents that travel back and forth between North America and Asia. The tempo is derived from the amount of time it takes audio to travel from Calgary to Beijing and back over a high speed research network (as of 2014). This creates the possibility for bi-located rhythms wherein different patterns are heard in each performance site. BeijCalgIndi is a structured improvisation performed for the IUPUI Telematic Collective concert on April 25th in Indianapolis and Calgary, and the morning of April 26th in Beijing. The piece used the digital presence workstation Artsmesh for connecting the locations. Blind Men and the Elephant was composed and performed as part of my master's thesis. The score consists of a series of repeating modules that are each one measure in length and are read on a computer screen in front of the performer. The instrumentation is variable but requires two polyphonic instruments and one monophonic instrument in a low register. In some modules, performers are given a set of pitches and a corresponding rhythm, but the pitches can be played in any order. In others, pitches are given in a certain order but the rhythm can be improvised. While in others, the modules are through-composed. The piece utilizes the fact that network music is performed over the internet by involving audience participation via Twitter. For each module, there is a legato version, a staccato version, a version with an accent pattern, and a version that changes dynamic. An audience member simply needs to send a tweet that includes one of the terms,“legato”, “staccato”, “accent”, or “dynamic”, and includes the username“@telephantmusic”. At numerous unknown points in time, the software built for the piece will search Twitter for these specific tweets and when they are found, it changes the performers’ score to reflect the audience members’ suggestions. Blind Men and the Elephant takes its title from an ancient story originating in southern Asia. Having suffused many religious traditions over hundreds of years, the story has come to be a valuable analogy for the manifold nature of truth. In the story, a group of blind men (or men in the dark) want to learn what an elephant is like. One man touches the leg and determines an elephant is like a pillar, one touches the trunk and determines an elephant is like a rope, and one touches the ear and determines an elephant is like a fan. Various versions of the story arrive at different conclusions. In some, the men argue violently over who is right or wrong, in others a sighted (omnipotent) person reveals that they are all partially right, yet in other versions the men come together to communicate and arrive at an agreement. Thus, the story itself is understood from various viewpoints, making it a clear example of self-reference. The ideas of perspectivism, pluralism, and self-reference are not only the inspiration for the sonic material of the piece but are also inherent in the process of its performance. At each performance space (or "node") sonic events unfold in different orders due to latency in the speed of data transmission. The piece itself, like all pieces of music, is one act, a singular sequence of sonic events. But each listener (and performer), depending on their location, hears these events unfolding in a different order. The beauty in this, for me, lies in the fact that a reconciliation of all perspectives (omnipresence) is physically impossible. There is no ultimate listening location, no one true form. The piece is shaped by momentary decisions of the performers and participation of the audience. Therefore, the reconciliation I mentioned is found only in the process of negotiation between disparate communities, and not in seeking a singular "true" work.